“Photography” is a professional study course under fine arts. It is also known as the hobby course. If you are an imaginative or creative, then photography is the best career option of your choice. Photographs are the best medium to show your creativity. If you are attracting with the visual world and wish to capture the moments surrounding you, then you may turn your hobby as a profession and can get the profitability. Get Latest Career Notification about Photography Courses, by entering your details below. By the growing trend of network communication and media, the professional photographers are in demand by the professional societies. “Photography is an art of collecting the images, moments and visual communication material with the help of technology & instruments”. Photography is a non-formal professional field. You may work even during the tour in your comfortable dress. You may be clicking in your local area in any celebration or party, and it May that you are clicking on the red carpet or at the African safari. Photography is an outstanding medium of self-expression. With the explosion of the communication network, Photography has now become a profession with huge commercial value. Photographers use their creativity, technical expertise & composition skills to produce and preserve images that tell a story or record an event. There are so many certificate and diploma courses in photography in India. Beside these, very few colleges provide the bachelor degree in fine arts and photography. The minimum education required for the professional course in photography is 10+2. These courses contain the knowledge of photographs, angle, lightning, technical knowledge of instruments as camera and understanding of fine arts. There are various Institutions in India, which offer traditional courses in photography, whereas some Institution imparts photography as a secondary subject. Students can pursue diploma, degree & certificate courses in photography according to their own choice. These programmes are offered in different domains of photography such as basis photography, digital photography, fashion photography, professional photography, motion picture photography, photo journalism etc. 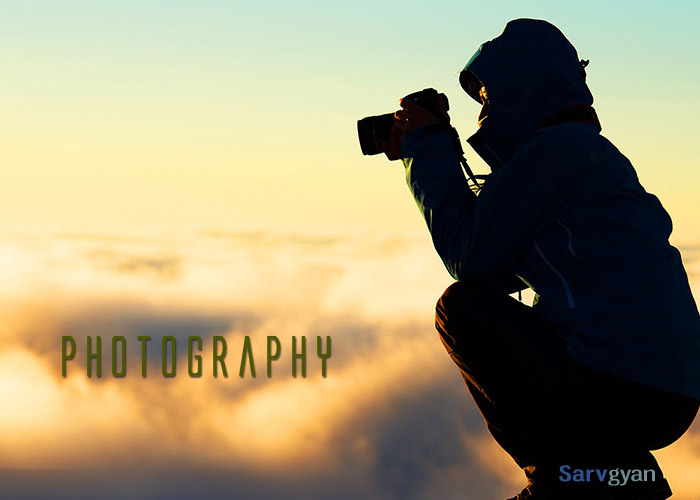 For the admission in the photographic field of education, you must have passed the 12th standard. It doesn’t matter your are from Science stream, Arts stream or Commerce stream, you can go for photography courses. If you have a command over computer or electronic then it is good for you to understand the technical part of this education. Suppose that you are travelling in first class coach or airbus and getting all facilities during your travel and boarding at one’s pocket. It means there is a lot of fun with zero% working irritation. There is no rule of office timing, dress code or limited expense. Photography is one of the glamour jobs. You may work with the organizations that are working in press, fashion field, advertisement, documentary field, magazines or tourism. There are many career options exists for Photographers. Photographer has an option to focus their career in a certain area of photography. Some common areas of specialization are commercial photography, news photography, fashion photography & scientific photography. Some photographers only shoot portrait photographs. Photographers may work for a company or self-employed. They can find assignments by networking & advertising. Photographers can also work in magazines, websites, television, weddings, newspapers, etc. As a Photographer, you can also work for advertising & marketing companies. They also sell their pictures in art gallery. You can also rum your own studios. To become a good photographer, you have both technical & creativity knowledge. You must have an extra interest & quality in color, visuals, light, etc. Photography field is constantly changing with the improvement of technology. There is not a shortcut to become a successful photography career. You have to work hard. Hence, you have to be fast-moving & willing to learn throughout the career. The popular photographers in India are Raghubir Singh Khatu, Raghu Rai, Kulwant Roy, Bandi Rajan Babu, Iqbal Mohamed. There is no fix salary for a photographer. The salary depends on your skill and your employer firm standard. A fresher can start the career with 100000 per annum, but after the experience if he got better platform, he may get the 3-5 lakh per annum. Some photographers may be paid an hourly rate. The salary of the photographer can vary depending on a several factors, i.e. talent & experience. In abroad, the average earnings of the photographers are $40,280. It is a very difficult task to search for a good photography books. Here, we have listed the best photography books to help you in this pursuit. If you have any query about Photography Courses, you can ask your query below. Hi, have completed 12th with science stream and i have a lot of interest in Photography. Being genuine i do not have any idea about Rules and regulation about Photography. Would request you to help me to choose any course. As i want my career as photographer. M studying in 12th and now it’s time to decide my career and I love photography so plz guide me what should I do after 12th should I directly apply to photography? Hlo…i m in cls 12 with science stream..n want to become a professional photographer..n work for national geographic channel..so..cn any1 hlp me what should I do aftr 12 ..? learn the course and then go to site of Nat GEo and click on career link. I have completed B.Tech with IT stream in 2013 and also worked in IT firm but now i want to switch my career to do something creative. I have a lot of interest in Photography and want to take it as my profession. I don’t have any idea about courses & how to get jobs after it. But I have a huge interest. Would request you to help me in choosing the course. As i want my career as photographer. you can join the course, and then they will guide you more on which camera you have to buy. sir, i m a repeater student of science stream and i have passed my 12th in 2014. is it necessary to do diploma and ceritifcate courses.i am new in this field and i am very passionate about it. i am intersrted in wildlife photography. i m in confusion so its a humble request to u to please tell me about this as soon as urgent..
hiii mohit negi plz tell me some colleges for wildlife photography in india. Hiiii. Guys . . .
I’m in 12 science . with my study and attitude and passion is photography &y dream is to become a professional photographer . . . .
How to do career in photography ? I love Photography…and I want to make me a Wildlife Photographer…Which is the best successful of my life..
you can pursue a courses in photography from any reputed institute. There always a demand of Professional Photographers, you can pursue diploma or degree course in photography. any body is here wch cn gv a beeter advice…..coz i m so cnfused. i m doing medical prepration ths time,,bt my phy nd che. is weak nd i like bio,coz here we studied about many organisms and animals. i like photography so much,bt cn we make a better carrier in ths field?,after read ths tell me cn i make a carrier in photography? What is the min.% req.in class 12 from Sc.stream of state board to do Photography course (Diploma). Please reply soo. Urgent. There is no percentage criteria as such. I wnna know about if there’s any institute in kolkata for photography….n whts the maximum tym limit for these type of courses if m just 12 pass …… please sirr help me..HELP ME PLEASE!!! i want to do diploma course after my 10th and do photography can i? Hi!can u plz tell me what course should i do if i wanna do photography travelling around the world..?? I am an amateur Photographer and want to be a professional one. i want to know that in commerce stream is there any source through which after 12th i can choose a course which is linked to Photography?? i,completed my graduation but by bsc physics. but i want to make career in photography,what should i do? dear, reel life is different from real life, but anyhow you may have option in Travel and tourism sector or Fashion Photography. I, Anchal want some information regading photography. Actually my brother want to became a professional photographer. In march 2016, he will complete his +2.He is very creative. Our hometown is in Mandi Gobindgarh. So, Please tell me how can he starts his photography career and from where he starts? Hey !! I’m a new one in the photography world.. Its my passion rather than I make it a profession but still I want to continue further studies in Photography! I love wildlife photography!! Could you please tell me about the institutions who carry this course!?? Thank You.!! I am a 15 year old student of class 10 and i am very keen in pursuing photography as a career. I am specially interested in nature’s photography. I belong from a middle class family hence it would be an uphill task for me to pursue this field, therefore i need a proper course of action and guidance. Please guide me to do the needful. If possible also let me know about the scope of pursuing this field in India as well as a rough salary estimate. I am only 10 standard so,can i become photographer?? ? .. Pease help me? Anyone?? You should pursue Photography after completing your 12th. Is it better to do photography course in India or abroad? And If abroad can you please suggest some names of the universities? This course comes under the fine arts. but how can we explore these course as my profession and how can these field help me to show my talent to make me a famous photographer. This course comes under the fine arts. You can join any institution and can get an bachelor degree. Salary is good in this field but to grab a job is not easy. You may be hired by any TV channal like discovery. any thing in which you are interested, and which is also job oriented. How much is the starting earnings in photography ???? Can you tell me something about the fine arts! And how much it charges? …plz tell me?? visual art is a stream of fine art that include the photography course. It is a BA degree. My family has financial problems, so they didn’t spend lots of money onn me! Very very thankful to you ? As u said i try my best as i can ! Go and get a degree in fine art form any nearby college which offer this course. This course is not so expensive and you may easily grab this course. After completing this degree you can find you in this profession. How make career in photography. Hey,i am currently doing my +1 from Delhi. I wish to pursue my carrier in photography preferably travel photography. I have been looking for some good institutions for photography(long term diploma course). 2) Do i need to give a generalised entrance exam or just the college one would work? 3) Basic requirements for admissions? 4) How to choose a DSLR ? 7) Do i need to wait for my result to get into a college or just the entrance basis? 8)can i make a future in thus carrier? 10) What should i do after my course is completed? 11) How to get a job being a travel photographer then ? WOULD BE GLAD IF ANYONE OF YOU WITH ADEQUATE KNOWLEDGE COULD SORT THE ABOVE THINGS OUT. you must be 12th passed for UG courses and 10the pass for diploma courses. no need to appear any entrance exam however some of the institution conduct the entrance but not only for photography courses. choose DSLR after a complete research on internet about the specification and compare with others. snap some historical and traveling snaps and make portfolia with best quality. some of the studios offer the portfolio work. The age should be minimu 17 years for UG and 15 years for diploma after 10th. the courses will be called as BFA. it has a good career just you click on the right paltform. How get diploma in 10th or after 10th..??? get the fine art (performing art) in UG and choose the photography. Not much but some institutions in Delhi and Mumbai offer that course. I want a contact no of a person who have done course. I like photo shoot and my target is photographer. Please help me i what to do. I love photography . I want to be wildlife photography. This article is useful to me. I’m in search for good course & career in photography. sir, i have jst cleared my 10+2 in commerce stream..
i have interest in photography and accounts also..
now am totally confused what i should choose..
photography or b.com and mba..
which line have more scope??? I want to be Wildlife Photographer. This Article is useful to me. I’m in search for Good course & career in photography……. we ca meet anywhere if both of us get a good job in this field. Hello. I’m totally sure that i want make photography my life. Want to convience my parents completely. Because my interests match to it, i have a little experience playing and clicking around pictures with a camera. (<- This might sound silly) My 12th results are still to come. After that, Am i totally free to choose my favourite course in photography?! And also go head in it in future?! Or is it like first to go for the basics and then choose my favorite one? Please help me with it. I Really want to know. First clear your basics and choose any good photography institute..and pursue any short term course in photography. I wanna become a photographer itz funny! ! It is one of the popular courses in photography…if you love wild animals, adventurous job, and natural beauty..than this course will be good for you.. I want my career in photography . So for that I just wanted to know the eligibility and what is the scope in choosing this line? There are so many beautiful things in the world. Which are always tempting me. I want to capture them. But i don’t know anything about its courses. I belonged to a poor family background. Even i don’t have enough money to buy a degital camera.Please give any suggestion how to make a carear in photography. hi narendra.. i also have the same problem as yours. but still i wish to make my career in this field.please if you have received any reply about courses regarding this … please do help me out too… eagerly waiting for reply. Photography offers you a career in which you live your dream and capture the most amazing things of the word, there are many institutes which are offering courses in photogrpahy. you may choose any of these courses, but you guys must remember that you should have to show patience to become a successful phogrpaher and to get hired by the top companies, agencies or TV channels. But the best part of being a photographer is that you can work as a freelancer and work for various agencies at the same time. I am in 12th standard and i am willing to persue photography . The fun part about it is that “gear doesnt matter”. Whatever camera you have , you can pull out great pictures and nobody will ask ” what gear did you use?” . Yeah they might sometimes ask but the frequency will be low . For starters , you can use your mobile camera and pull out good pictures. Your work will come in handy as you grow to become a good photographer who doesnt depend on gear much – this is the thing which is required. just go out and click great photographs and learn . and then practice , practice and practice . Thats it. Work hard for it. i love photography and want to become a professional photography….. There are various short term courses that you can choose to become a professional photographer. It will be better if you go for photography after your 12th, the photography courses ranges from 2 months to 1 year, there are different types photography like fashion, Wildlife, Media, Sports etc…first you have to do foundation course and then you can select any one of the above as per your interest and can go for internship with some senior photographer. yes you can ask your query over here.. I am only 10 standard can i become a photographer?? ? ?help me please.. ..
H,I have completed 12th with arts stream and i have a lot of interest in Photography. Being genuine i do not have any idea about Rules and regulation about Photography. But i have a huge interest. Would request you to help me to choose any course. As i want my career as photographer. I am persuing in XII in commerce stream. I am interested in photography/camera man so I want some professional degree courses in the same. Please guide me if there is any scope of specialization after BJMC or BAJM. It is for fashion technology but photography is also included in academia.